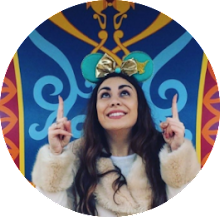 I hope you're ready for more from my Shanghai Disneyland trip! 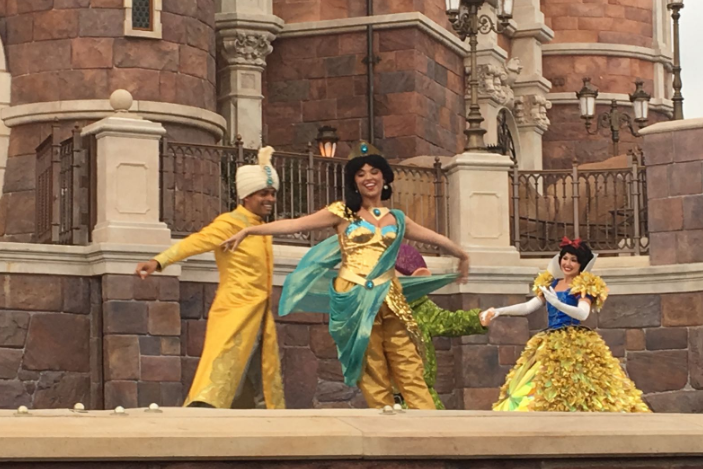 As my post 'We're going on a Princess hunt' was such a success, I've decided to provide you with an extensive list of precisely where you can spot each of the Disney Princesses currently at Shanghai Disney Resort! Enchanted Storybook Castle Meet 'n' Greet: Snow White is one of a few Princesses available to meet with in the Enchanted Storybook Castle courtyard. 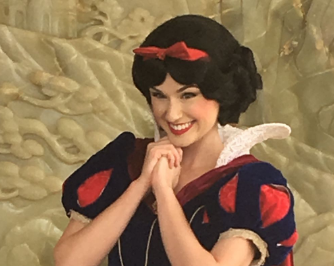 Despite the claim that the Castle in Shanghai Disneyland represents each of the Disney Princesses, as Walt's creation and the first of the official Disney Princesses, Snow White is definitely (in my opinion) the most 'prominent' Princess within the park. 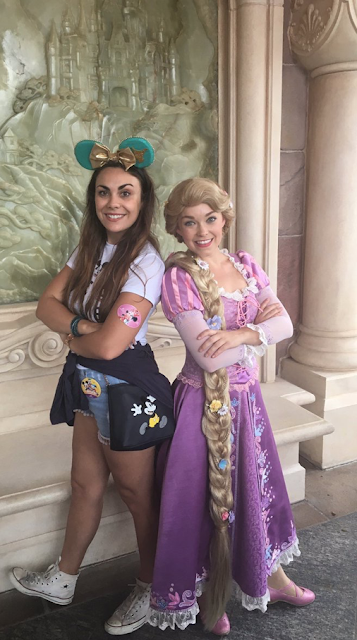 Enchanted Storybook Castle is the first of the Disney castles that does not 'represent' a specific Princess: California, Paris and Hong Kong each host Sleeping Beauty Castle, whilst Cinderella Castle is located in Orlando and Tokyo. Golden Fairytale Fanfare: Golden Fairytale Fanfare is a show performed on the Enchanted Storybook Castle stage. 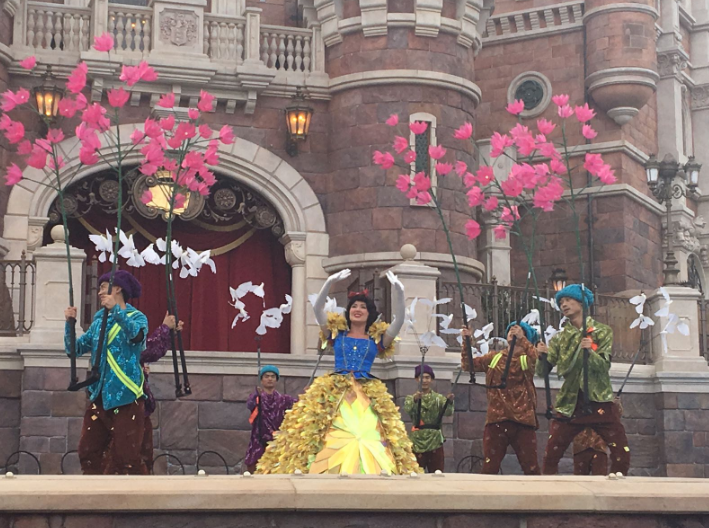 Snow White was featured in the show wearing a variation of her traditional gown which was adorned with golden flowers and butterflies. "Once upon a Time" Adventure: Probably one of the most exciting things announced for Shanghai Disney Resort was the promise of a ride actually inside of the Castle. However, in reality, what we were left with was a little bit of a let down; a walk through attraction which tells the tale of Snow White and The Seven Dwarves through the mediums of screens, computer animation and visual effects. 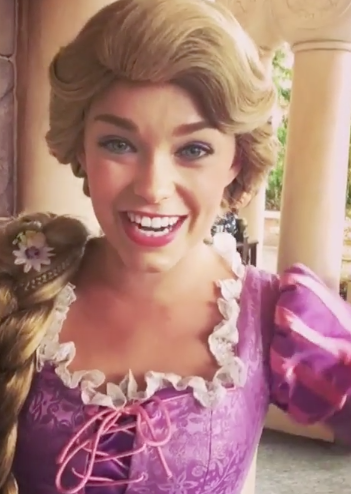 As the only Disney Princess featured within this attraction, Snow White is the star of Shanghai Disneyland's 'Once upon a Time' Adventure... a huge disappointment. 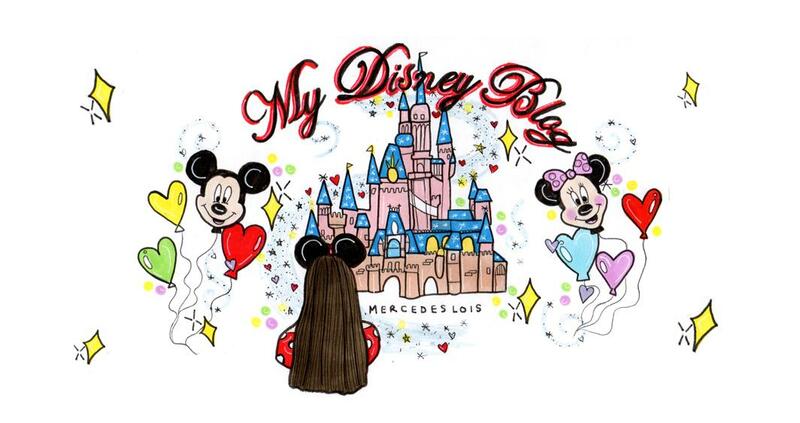 The Bibbidi-Bobbidi-Boutique is just about the only trace of Cinders in the park! I didn't see much evidence of Cinderella in Shanghai Disneyland during my trip. 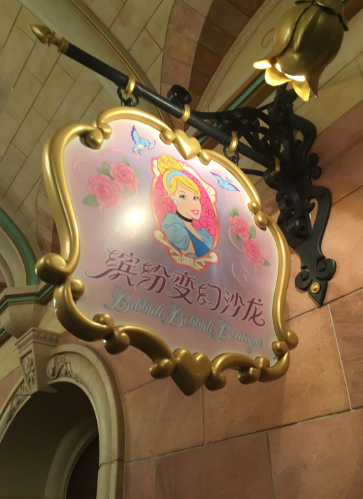 However, each Disney Princess is represented inside the Enchanted Storybook Castle with a flag and carved plaque depicting them. 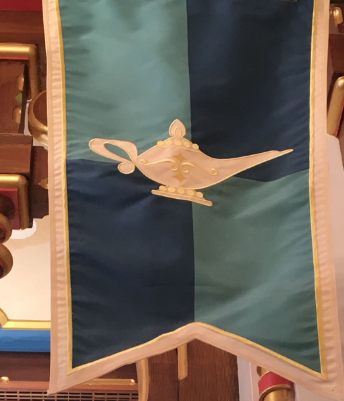 Cinderella's flag featured a glass slipper, naturally. Sleeping Beauty is another absent Princess in Shanghai Disneyland but she was of course also featured within Enchanted Storybook Castle with a flag and carved plaque. 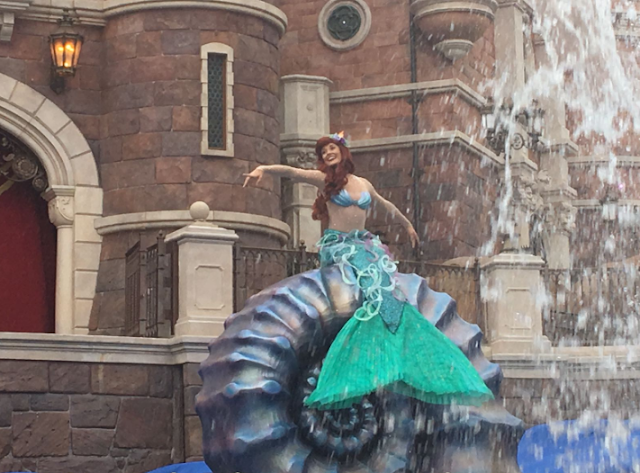 Golden Fairytale Fanfare: Ariel is featured in the show in both mermaid and human form along with Flounder, Sebastian and Prince Eric. Her ballgown at the end of the show is a golden variation on her usual green, park dress. 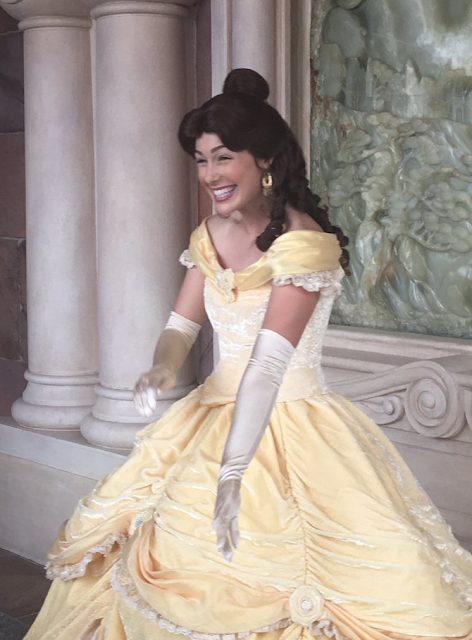 Enchanted Storybook Castle Meet 'n' Greet: Belle is one of the Princesses available to meet with in the courtyard. This was the first time I had seen Belle's new gown in person which I have to say, is beautiful. Voyage to The Crystal Grotto: Voyage to The Crystal Grotto is a cute little whimsical boat ride, similar to Les Pays des Contes de Fées in Disneyland Paris. Beauty and The Beast is just one of the animated movies featured on the ride and Belle is represented as a beautiful statue dancing with the Beast in the middle of a gorgeous water fountain. Shanghai Disneyland Hotel: Beauty and The Beast is also featured heavily inside the Shanghai Disneyland Hotel. 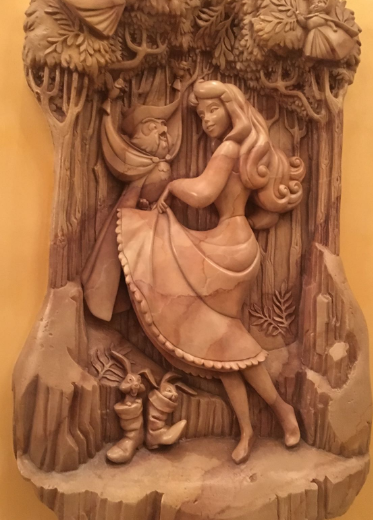 A large statue depicting Belle with The Beast along with several paintings can be found in and around the dining area of the hotel. 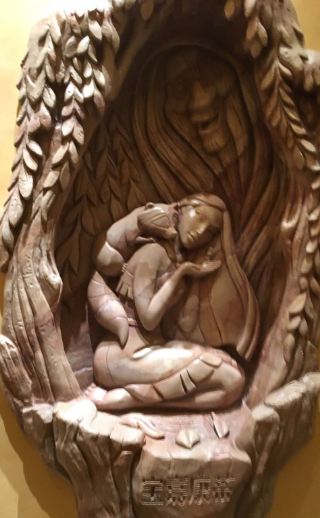 Sadly, along with Cinders and Aurora, I didn't see any trace of Pocahontas during my trip to Shanghai Disneyland aside from her carved plaque and flag inside the Castle. Pocahontas' flag featured leaves blowing through the wind. Mickey's Storybook Express: I must admit, I was quite disappointed with the lack of Mulan depicted within the park. 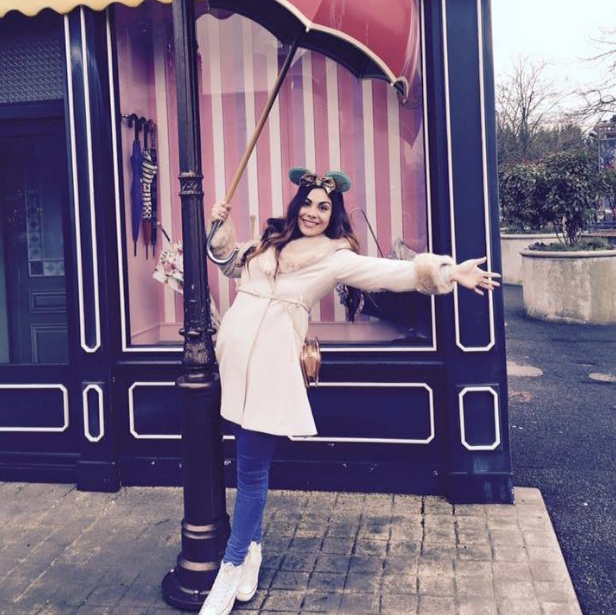 Don't get me wrong, her presence was generally more evident in comparison to the other Disney parks around the world however, I expected a little more! 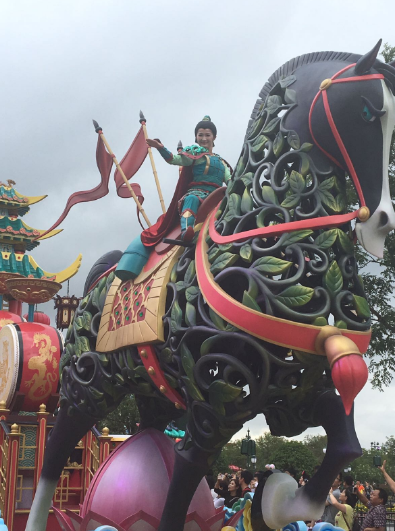 That said, Mulan had a huge float in Mickey's Storybook Express Parade which featured traditional Chinese dancers, drummers, lanterns, a huge model of Khan and gorgeous flags of red and gold. Voyage to The Crystal Grotto: Mulan was depicted on this ride along with Mushu, Khan and Cri-Kee. Ignite The Dream: Ignite The Dream is Shanghai's version of the classic Disney park firework display. The projections on the castle were awesome (especially the Pirates of The Caribbean and Star Wars sections) however, the fireworks were slightly underwhelming. A large portion of Ignite The Dream was dedicated to Mulan the movie and featured gorgeous Chinese lanterns which floated up the castle turrets. 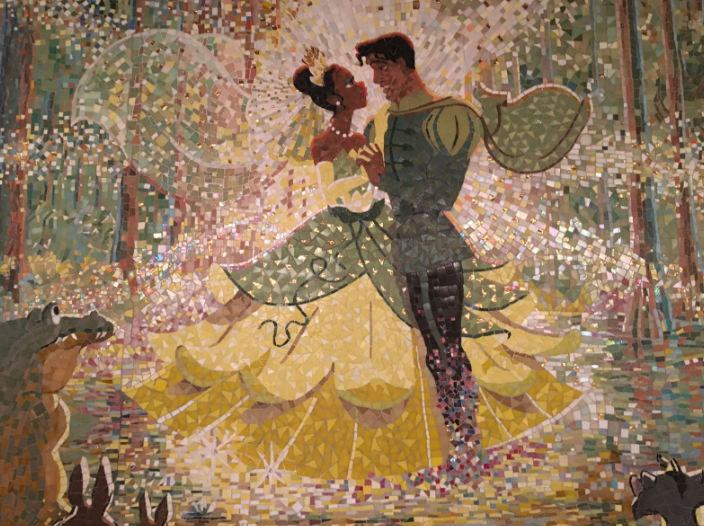 Enchanted Storybook Castle: In addition to her carving and flag, Tiana also had a beautiful mosaic plaque inside the Enchanted Storybook Castle in her honour. Generally Tiana was quite absent from the park; I saw almost no merchandise from The Princess and The Frog within the stores. Enchanted Storybook Castle Meet 'n' Greet: Rapunzel was the third and final Princess available to meet outside the impressive Enchanted Storybook Castle. Mickey's Storybook Express: Rapunzel was featured in the parade along with Flynn Rider and an entire troop of 'ruffian' dancers. Voyage to The Crystal Grotto: Rapunzel and Flynn were also present on this picturesque boat ride featuring classic Disney stories. 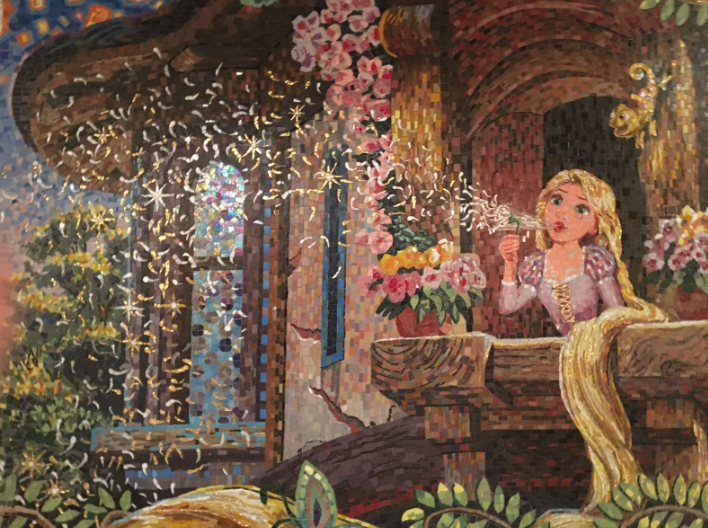 Enchanted Storybook Castle: As one of the revival Princesses, Rapunzel was also depicted on a mosaic inside the castle blowing dandelions. Golden Fairytale Fanfare: Merida was featured in the show along with her pal Angus. I really enjoyed this section of the show which featured bagpipes and the wonderful music from the movie Brave. 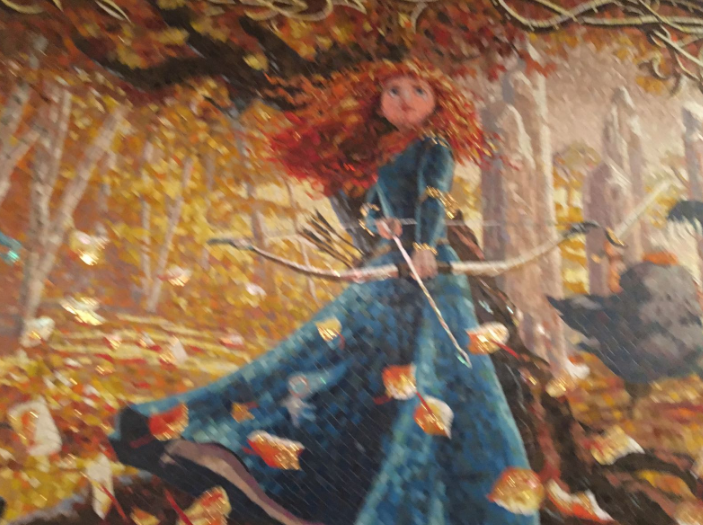 Enchanted Storybook Castle: Joining Tiana and Rapunzel, Merida was also featured on one of the Castle's mosaics as the third revival Princess. 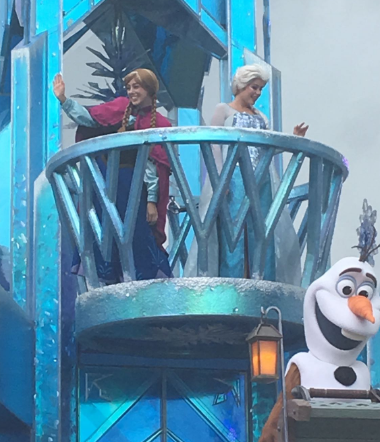 Mickey's Storybook Express: Anna had a very large float with her sister Elsa during the parade. Olaf was also present along with a HUGE model of Marshmallow! 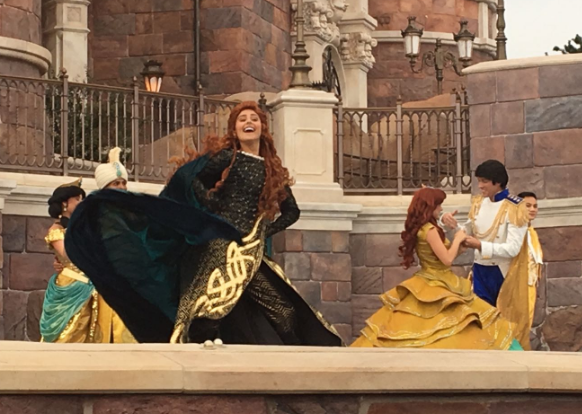 Golden Fairytale Fanfare: Anna was present during the Castle stage show. I really enjoyed the Frozen portion which used water effects throughout 'Let It Go' to give the impression of Elsa's Ice Powers! Enchanted Storybook Castle: Joining Tiana, Rapunzel and Merida, the final mosaic captures Anna ice skating with her sister Elsa. Mickey's Storybook Express: Elsa appears on a large Frozen float during the parade. Golden Fairytale Fanfare: Elsa is present within the show and wears both her traditional blue gown and a golden variation for the finale. 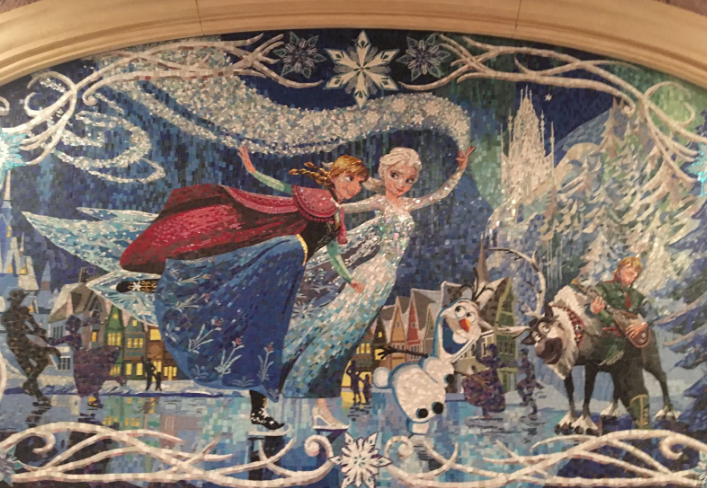 Enchanted Storybook Castle: Elsa is the final Princess pictured on a mosaic along with Anna in the Castle, concluding the revival Princesses. 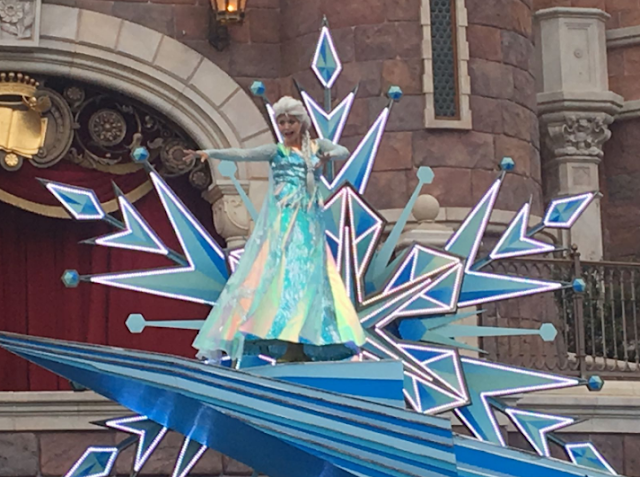 Ignite The Dream: "Let It Go" is one of the songs featured within the display and features Elsa for quite a length of time in the beautiful water projector. I hope that you have found this post useful if you are planning a Shanghai trip soon or simply enjoyable if not. If you have any specific questions about this post, please let me know in the comments below. 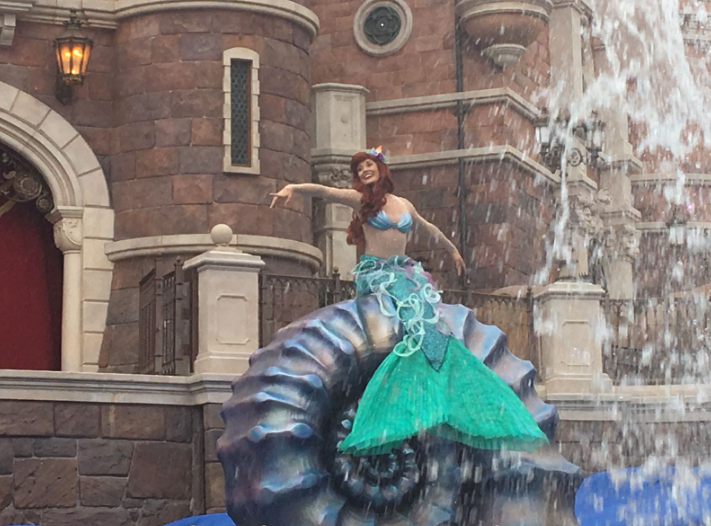 I still have lots more to say on Shanghai Disneyland so as ever, check back for more updates soon!